Should a Club Adopt the Local Rule on Lost and Out-of-Bounds Balls? This local rule should pass three tests before it is adopted by a club. First, is it needed? Second, does it actually increase the pace of play? Third, is the cost of administering the rule worth any perceived benefit? Need – Typically, local rules should only be adopted when abnormal conditions make it impractical to abide by the Rules of Golf. Examples would be prohibiting play from environmentally sensitive areas, allowing the removal of stones from bunkers, and allowing preferred lies. This local rule does not meet the requirement of abnormal conditions and is promoted solely to increase the pace of play. If a ball being hit out-of-bounds or lost is a common occurrence, then the local rules would pass the needs test. If not, this local rule is a worthless addendum to the rules sheet. This local rule will come into play primarily in singles stroke play events. In match play or better-ball events a player who believes his ball is out-of bounds will usually play a provisional ball (more on this later). If he does not, and finds his ball out-of-bounds, he often does not go back to the tee, but disqualifies himself from the hole. In either of these cases, the local rule is of no use. There are courses where balls can be easily lost. 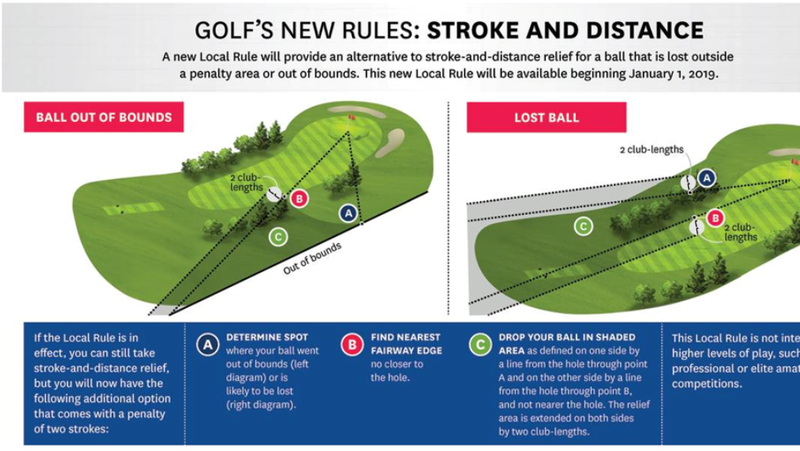 The new rules permit the committee to declare areas where balls can easily be lost (e.g., gorse, woods, and raw desert) penalty areas. If many lost balls are now in what can be considered penalty areas, the need for this local rule is greatly reduced if not eliminated. Pace of Play – The USGA argues this local rule would increase the pace of play. There are counter arguments that contend it will not increase, and possibly decrease, the pace of play. A player who finds his ball out-of-bounds still has the option to return to the tee. For example, assume a player hooks his ball out-of-bounds on a par 3 hole. He finds it (Point A on the figure below) some 60 yards from the hole. He can now drop the ball on the fairway 60 yards from the hole and be hitting four or return to the tee hitting three. After a few minutes of calculating his odds of making a five, he decides to re-tee. In this case, the new local rule actually decreases the pace of play. While some of the new rules are intended to diminish conflict among competitors, this local rule does not. The question of whether a player hit the ball twice, for example, does not need be resolved under the new rules. This local rule, however, can lead to disagreements among competitors. Assume a player hits the ball out-of-bounds on long par four. The ball is not found, but all participants’ believe the ball went out-of- bounds. The player who hit the ball believes the ball traveled twenty yards further than his opponent believes. The Committee is called and it decides that without any contrary evidence, the player’s judgment should prevail. The player drops his ball at point B. His opponent argues the ball is now closer to the hole than point A. Both players draw their range finders and conclude the ball must be dropped five yards further back. In this case, the local rule increases both the time of play and the enmity among players. There are also cases where the local rule is difficult to apply. One example would be when a player’s ball is out-of-bounds behind he green. A player must first estimate how far the out-of-bounds boundary is from the flagstick (i.e., Point A). Then he may have to walk back to the fairway to find the nearest point no closer to the flagstick (i.e., Point B). The player now has a large swath of “general area” created by an arc connecting Point A and Point B. If the player takes anytime deciding the best place to drop, the local rule will not increase the pace of play. If a player goes back to a tee (either the one played from or a forward tee) under the local rule, he would be hitting four without a tee. A better option might be to abandon the original ball and be hitting three with a tee. Again, the local rule does not increase the pace of play. This local rule option is not available if the player hits a provisional ball. A player is well advised not to hit a provisional ball, but proceed to the out-of-bounds ball and analyze his options. If he finds, for example, his Point B is further from the hole than his typical drive, he can then return to the tee and hit his third stroke. Again, whether this local rule increases the pace of play is questionable. Cost of Administration – Members at clubs will eventually understand the geometry of this local rule if it is adopted. Visitors unfamiliar with the rule could struggle. The club could publish a lengthy rules sheet explaining how to determine Points A, B, and C. Such a sheet is unlikely to be read and would obscure other local rules that are more likely to come into play. Clubs have the option to suspend this local rule for some tournaments. If the rule is not suspended for the club championship, players could be insulted that their tournament is not a “higher level of play.” If it is suspended the Committee must make sure the suspension is included on the tournament rules sheet. The "on again off again" nature of a local rule leads to confusion and should be avoided. These are not large administrative problems. A club must assess whether even these minor hassles are worth the limited benefit of the local rule. Conclusion – The USGA’s objective was to make the game simpler and faster for the recreational player. This local rule will not meet these two objectives at most clubs. The local rule is not simpler than having a player hit a provisional ball. And if the Committee is worried about the pace of play, it has better weapons in its arsenal such as conducting tournaments with Stableford scoring. Another argument against the local rule is it violates the principle that everyone plays by the same rules. The USGA followed this principle when it allowed all golfers, regardless of ability, to drop outside of a bunker with a two stroke penalty. To be consistent, the USGA could have made the relief procedure in this local rule an alternative to stroke and distance relief found in the Rules of Golf. It did not. It could be the USGA believed the local rule option would affect the equity of the game by favoring the long hitter. Or it could have believed having Tiger Woods drop a ball in the fairway after an out-of-bounds shot would be too big a departure from the history and traditions of the game. While this local rule looks like it should be rejected on its merits, many clubs will adopt it merely because it comes with the imprimatur of the USGA. This will allow for an evaluation of the local rule based on empirical evidence and not the speculation. Any comments by readers on how this rule works in practice would be greatly appreciated. The USGA argues the U.S. Open is “not designed to embarrass the best golfers, but identify them.” But does it? Critics have charged that the way U.S. Open courses are set up has made scoring more a matter of chance than of skill. For example, well struck irons often bound over greens and into USGA-type rough. The player's next shot then depends in large part on his lie (i.e., luck). The merits of the maniacal set-up for U.S. Open courses are problematic. The U.S. Open is played on a course that exists for only one week every year – the USGA version of Brigadoon. Golf is unique among major sports in holding its championship under conditions that are not normally encountered during the season. Are these criticisms valid or just carping from traditionalists who still harbor resentment from Jack Fleck's victory over Mr. Hogan in 1955? If the critics are correct, the winners of the U.S. Open should be weaker as a class from the winners of other major championships. Two measures of the strength of champions are used here. First, if luck rather than skill is a major determinant in winning there should be a larger number of one-time winners. That is, players who win the U.S. Open, but do not win any of the other majors. Second, if a player is simply lucky to win the U.S. Open, then he may not have the skills to go on to win many other major championships. If the critics are correct in their assessment, U.S. Open Champions should not be as strong a group as champions from other majors. Specifically, the average number of "majors" won by champions of the U.S. Open should be less than the average compiled by champions from the other majors. To test these two assertions, the winners of the traditional major golf tournaments (Masters, U.S. Open, Masters,The Open, and PGA Championship) were examined over the past 31 years (1974 to 2004). First, the number and percentage of champions who did not win any other major were found as presented in Table 1. The U.S. Open ranked third among the majors with 12 of its 22 champions having never won another major. The PGA has the highest percentage of champions (60 percent) who were not able to win another of the traditional majors in the time period studied. The U.S. Open did, however, have the most repeat champions (five) who had not won any other major (Andy North, Hale Irwin, Lee Janzen, Curtis Strange, and Retief Goosen). This frequency may indicate the U.S. Open champion is being selected from a smaller pool of players than at the other championships. That is, players with only certain attributes to their game appear capable of winning. The skills for a good U.S. Open player, however, may not translate well to the venues of the other major championships. The average number of "other" major championships for each group of winners was calculated as a measure of the quality of the champions. For example, the 20 different winners of the Masters won 27 other major titles for an average of 1.42 per player. These results for other majors are shown in Table 2. By the average number of majors won, the U.S. Open is tied for second with The Open. And to show the tenuous nature of this ranking, if Tom Watson had not made that fortunate chip shot at No. 17 at Pebble Beach and gone on to lose, the U.S. Open would lose his 7 other major titles. A loss by Watson would have put the U.S. Open rank down with the PGA by this criterion. By the two measures used here, there is no clear evidence that the difficult course set-up of the U.S. Open identifies excellence with more precision than any other tournament. It does, however, identify a certain type of golfer that may not have much of a chance at the other majors. For example only four U.S. Open Champions in the past 27 years have also won the The Open (Nicklaus, Watson, Woods, and Els). Only five U.S. Open Champions have also won the Masters in this same period (Floyd, Nicklaus, Watson, Woods, and Zoeller). Surprisingly, until Woods victory in the 2000 U.S. Open Championship, no U.S. Open champion since Larry Nelson in 1983 had gone on to win another of the majors. In summary, the U.S. Open does not produce the “best” champion by any of the criteria examined here. Nor does it appear to produce any more “fluke” winners than the other majors. The number of repeat U.S. Open champions with no other major championships suggests the U.S. Open set-up may be limiting the winner to a small sub-set of players. There are signs, however, that the USGA is changing. Since Pinehurst in 1999, the U.S.Open has had a less severe set-up. The fairway rough has not been as penal as usual. Rough around the greens at Pinehurst, for example, was minimized to give the player more options for his short game. Courses have also been lengthened which favors the long hitters who also sit atop the world rankings—Tiger Woods, V.J. Singh, Phil Mickelson, Ernie Els, and Retief Goosen. These changes seemed to bring more of the marquee players into contention. Whether this is a case of temporary sanity or a sea change in USGA thinking, only time will tell. An earlier version of this chapter appeared in Dougharty, Larry, Identifying Excellence, Golf Journal, USGA, July 1993. Championships won before 1974 were not included in the analysis. Will any increase in accuracy due to daily handicaps be worth the daily hassle of calculating that handicap? If a player’s Index is volatile, daily handicaps could provide a more accurate estimate of his potential. The Index of most players, however, is marked by low volatility. For these players, the Daily Handicap will not differ significantly from a handicap computed twice a month.